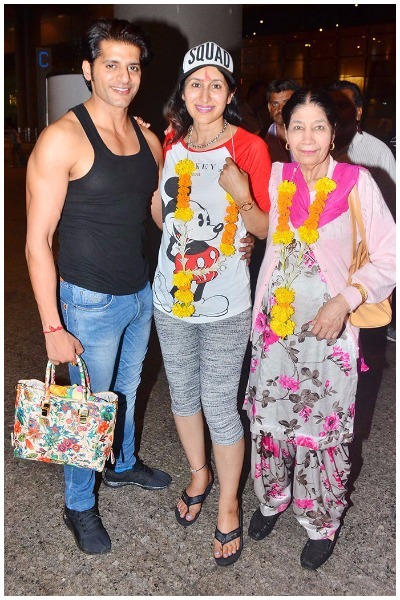 Colors TV serial Naagin 2 actor Karanvir Vohra, wife Teejay Sidhu with their twin daughters are back to their home, India. 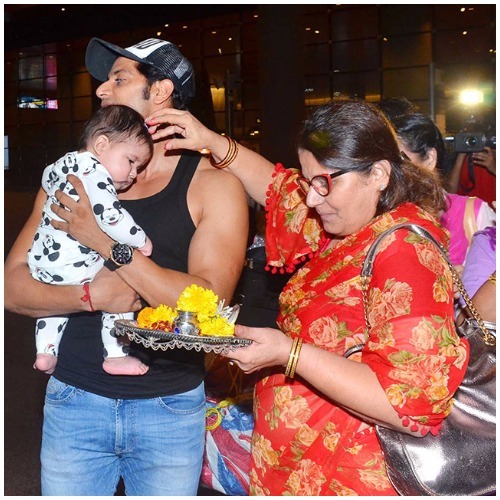 Karanvir Bohra became father to his twin daughters in last October, 2016. His wife Teejay delivered the twin babies in London and returned back to India now. Karanvir used to visit every now and then to see his wife and twins to London. After six months of their birth, Karanvir and Teejay brought their twin daughters back home Mumbai. As soon the parents with twin babies arrived at the airport, they received a warm welcome from their family. The couple who were sharing the pics of their daughters on social media got the shutterbugs curious to get the closer glimpse of their twin daughters at the airport. When the couple got surrounded by media, they quickly hide their babies but were not annoyed with shutterbugs clicking their pics. Teejay and her kids received warm garland welcome and aarti from the family members at the airport. Teejay was spoted wearing Mickie and the Mouse printed tee and her twin daughters wearing identical Mickey Mouse baby suits. The family back home was equally excited to welcome the Bohra’s back Mumbai. Aren’t these Bohra sisters cute!!? Previous : In Pics: Sonam Kapoor Attends National Awards Ceremony With Rumored Boyfriend Anand Ahuja!